The photographs are presented in (roughly) chronological order. 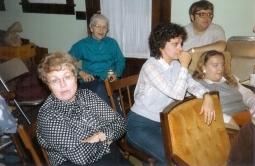 Click on the photograph shown on this page to see a larger version of the same picture. 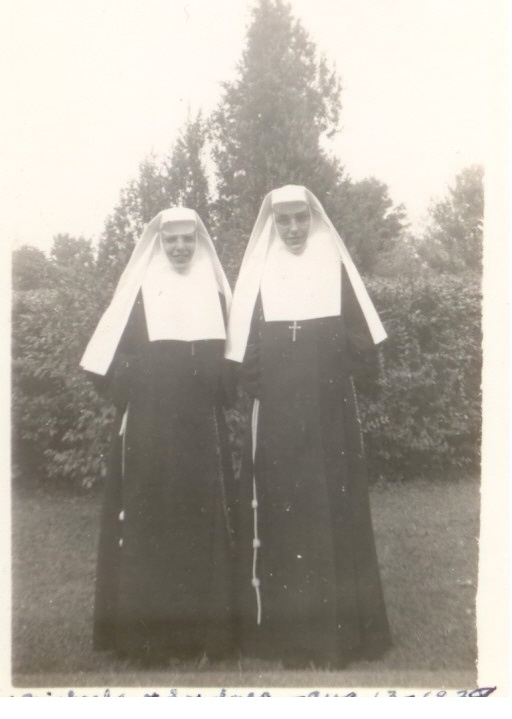 Sr. Michaela and Sr. Inez (Schuman), August 13, 1939. Sr. Inez is a cousin; her father John was the brother of Sr. Michaela's mother, Irene. Behind the rectory in the schoolyard. 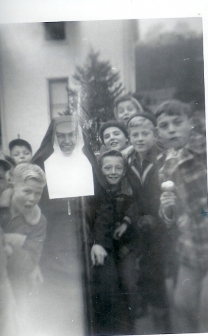 Sr. Michaela wrote on the back: "Nine of my twenty-five boys around me". Cincinnati, Ohio (? 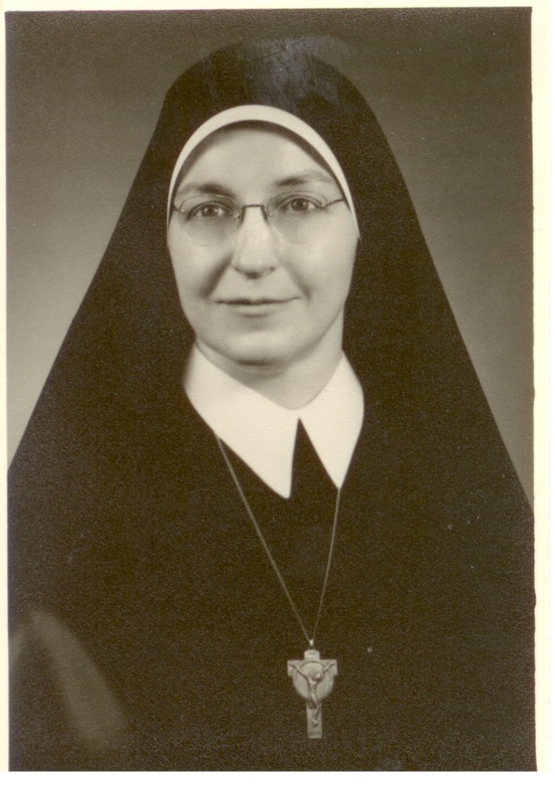 ), around 1945. 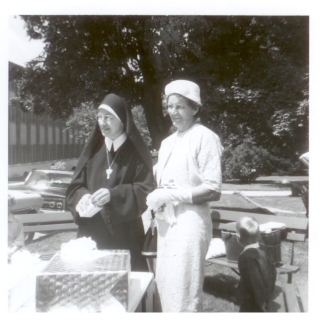 25th Anniversary of Sr. Michaela's joining the Order of St. Francis (OSF). 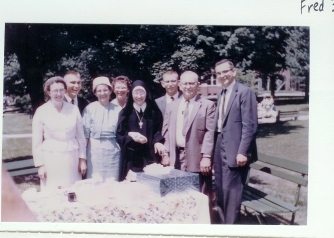 From left to right: Margaret Mary, Clarence, Irene (mother), Mary Eileen, Sr. Michaela, Frederick, Michael (father), Charles. 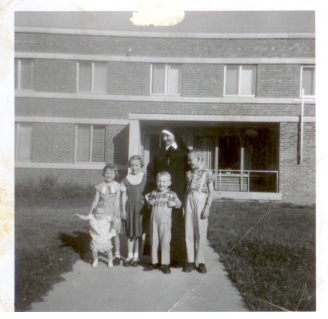 This is a family picture with all of her brothers and sisters. 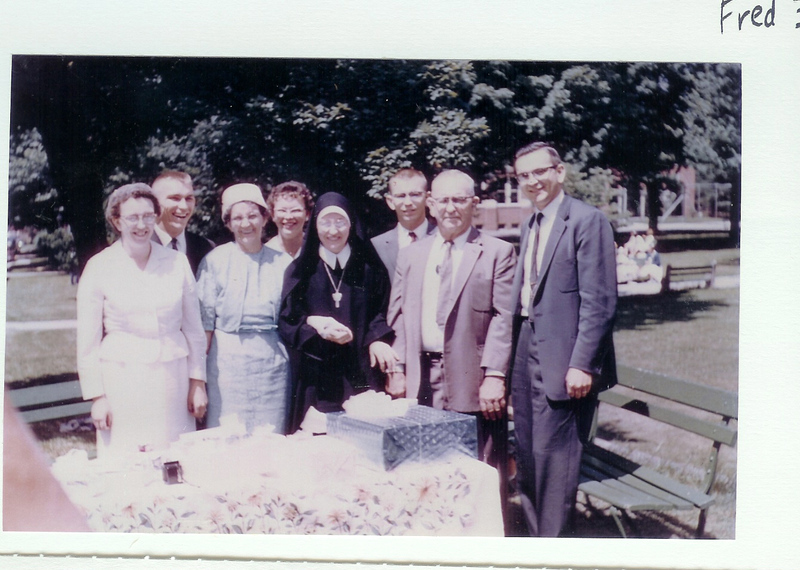 July 26, 1962. 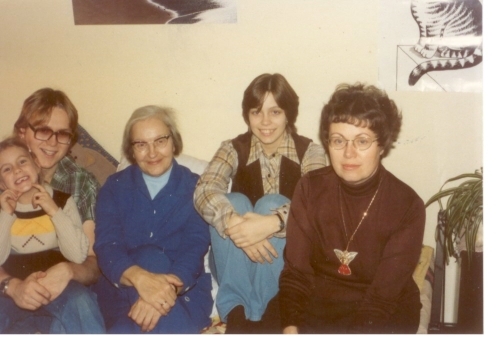 Kathi, Mike, Sr. Michaela, Marianne, and Charlotte, in Marianne's dormitory room at SUNY-Binghamton. March, 1979. 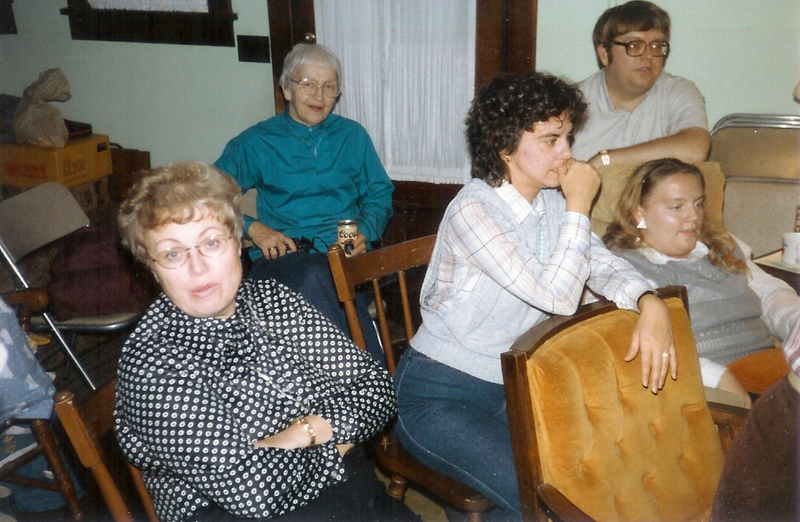 Family get-together at Margaret Mary's home, Rushville. 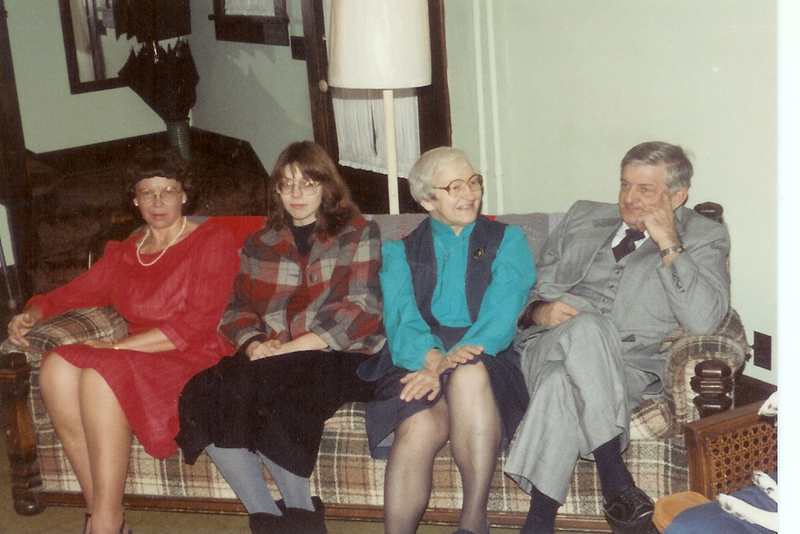 From left to right: Charlotte (sister-in-law), Sr. Michaela, Gloria (wife of nephew Steve), David (nephew), Marcia (niece). About 1980. 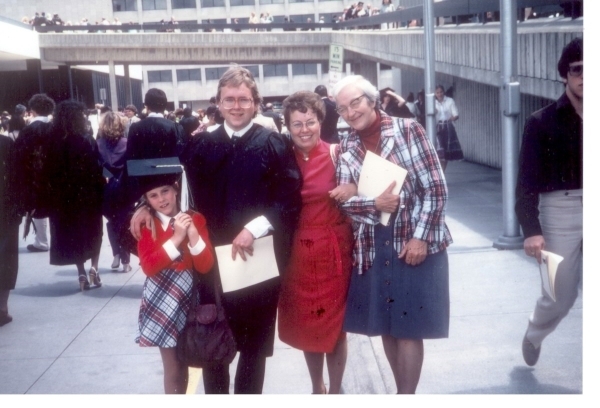 Mike's graduation from SUNY-Binghamton in June, 1981. Kathi, Mike, Charlotte and Sr. Michaela. 90th birthday celebration for Michael Mueller, Sr. Michaela's father, at the American Legion Hall in Rushville, Indiana. 1984. Four on a couch! 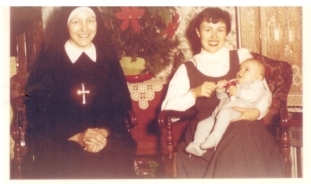 Mary Eileen (sister), Marianne (niece), Sr. Michaela, Kenneth Zinser (son of Aunt Clara, who was sister of her mother Irene). 1984. 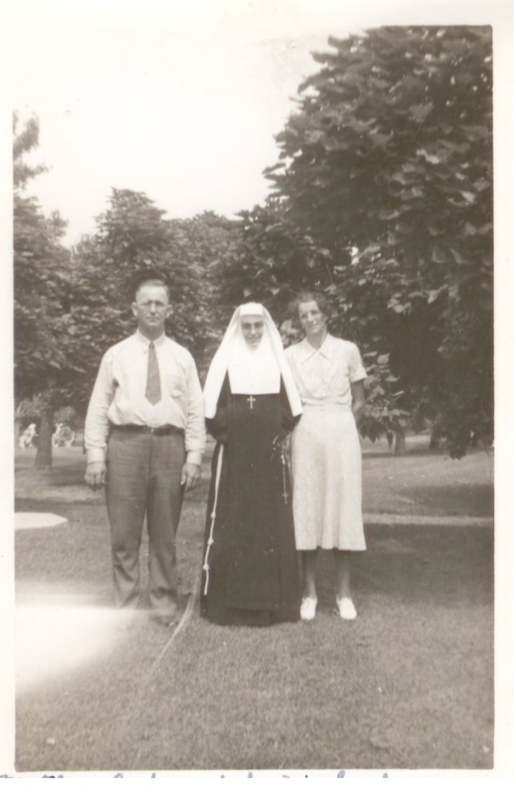 Linda, Clarence and Sr. Michaela in Margaret Mary's home, Rushville. 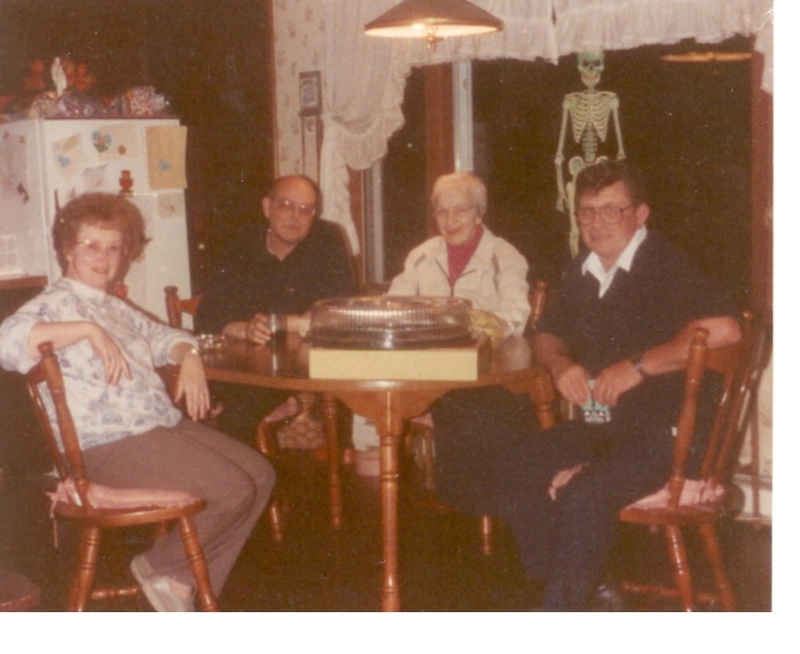 Fall 1985. An improbable impromptu family gathering at Hunter's Mountain, upstate New York. Everett and Mary Eileen drove up from Florida with his Aunt Anita, and Sr. Michaela drove in from points midwest. 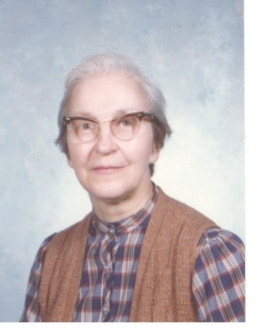 About 1990. 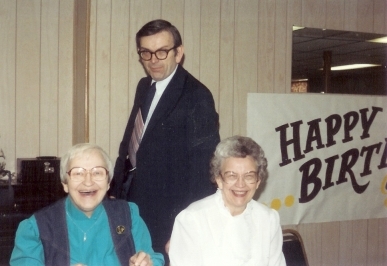 Everett, Sr. Michaela, Aunt Anita, Charles. 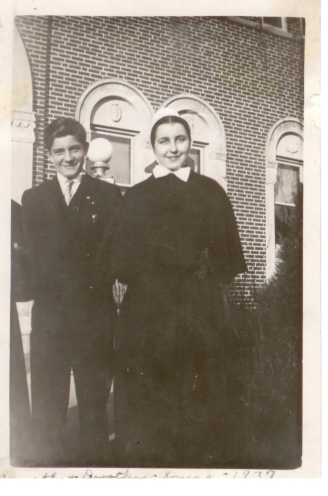 Charles and Sr. Michaela in the dining room of Charles and Charlotte's home in Endwell, New York. About 1992. Bob and Kathi Shockney write: "We spent many evenings like this, solving all the world's problems." 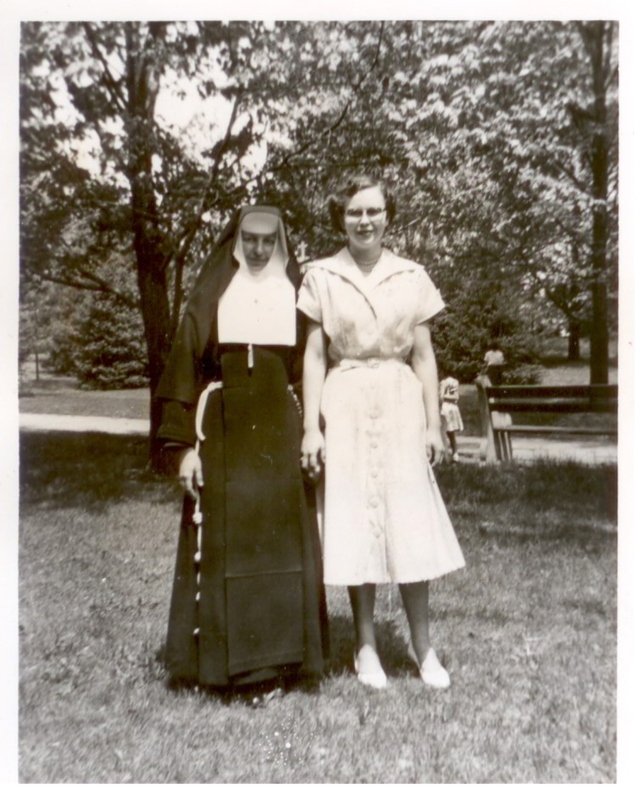 Left to right: Kathy Shockney, Fr. 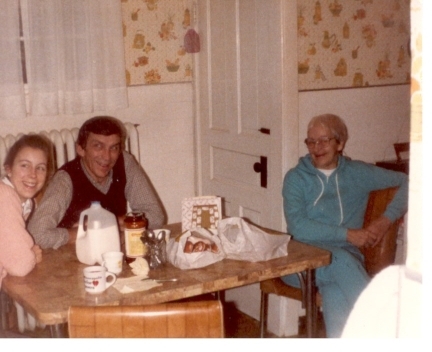 Keith, Sr. Michaela and Bob Shockney. 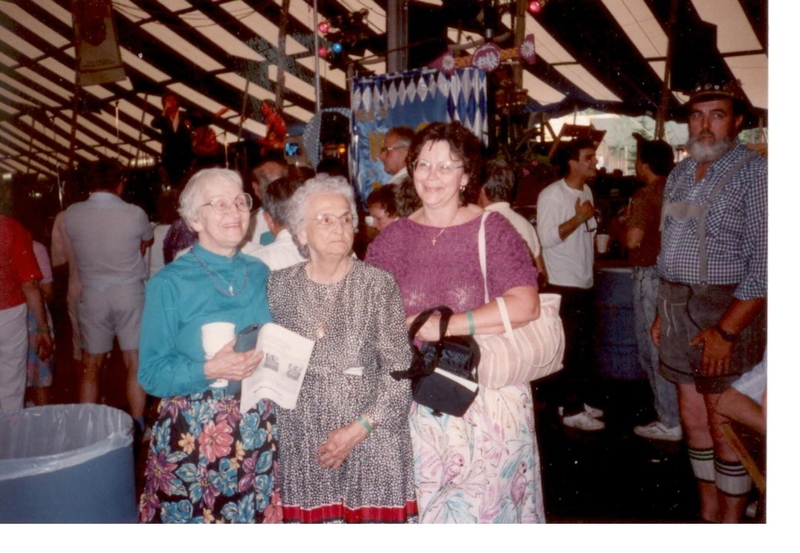 About 1992 or 1993. 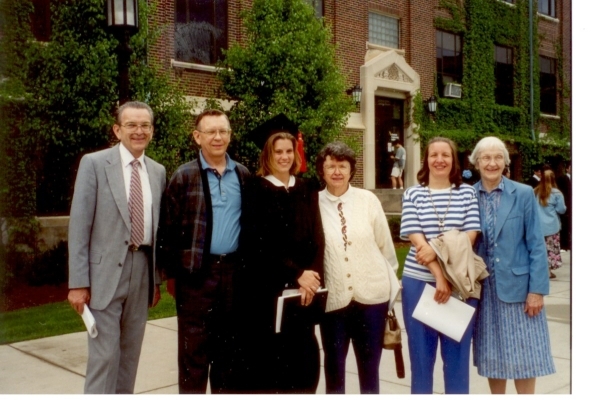 Kathi graduates with a Bachelor of Science degree in Chemical Engineering from Purdue University, June, 1994. 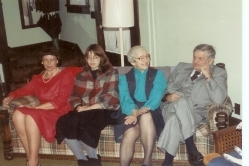 Charles, Frederick, Kathi, Anne, Jody, Sr. Michaela. 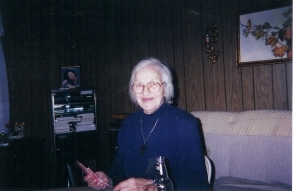 Sr. Michaela playing cards in Mildred Homan's home in Coldwater, Ohio, in their family room. 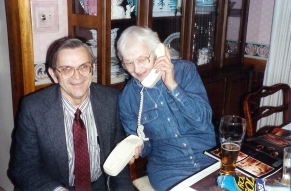 Around 2003. This is the last picture we have of Sr. Michaela; article and photograph from July, 2006. This photograph looks MUCH better in the larger version - do click on this small version so you can see the decent version! 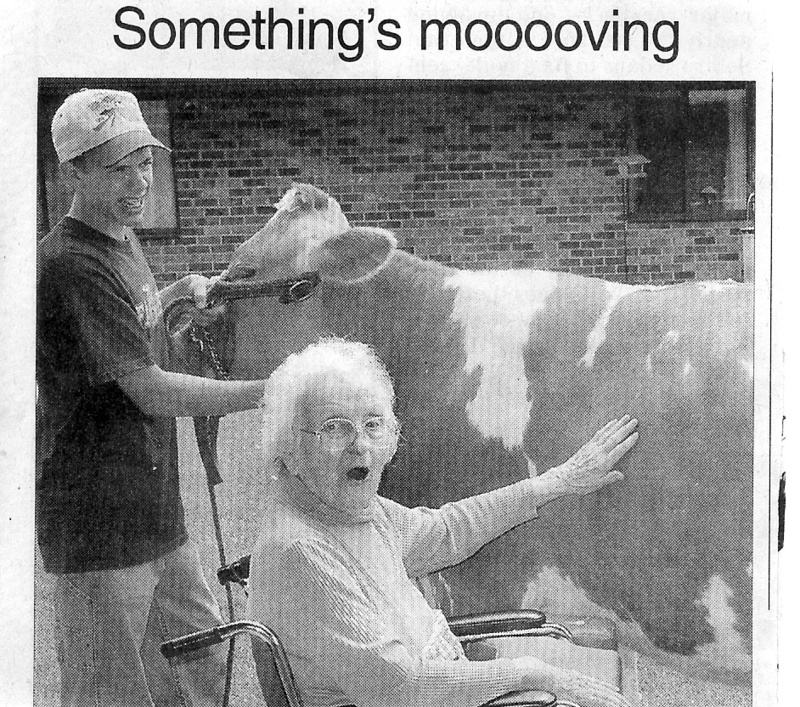 June was National Dairy Month and Celina Manor Nursing Home celebrated the event with a few local farmers. One of the various activities included a visit from Coldwater teen, Craig Hartings, who brought along his Mercer County Fair show cow and two calves. Residents were invited to pet and bottle feed the calves. Sister Michaela Mueller is pictured petting the show cow and was surprised when Hartings told her that the cow would be giving birth to a new calf in the new future. Everyone enjoyed homemade cookies and worked on their milk mustaches with cartons of white and chocolate milk. 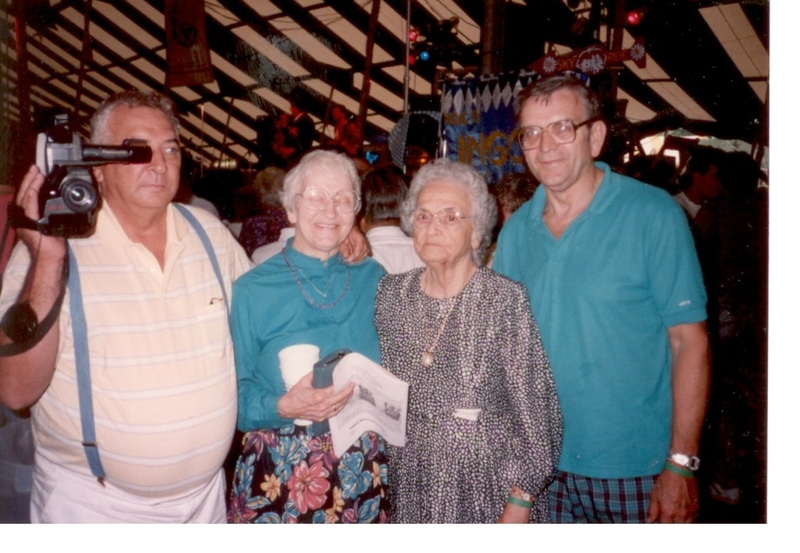 Celina Manor has been serving the community for over 28 years. 2290 Ocean Shore Blvd. #508, Ormond Beach, FL, 32176; 386-441-7335 (November-May). Click here for information on how to order prints.